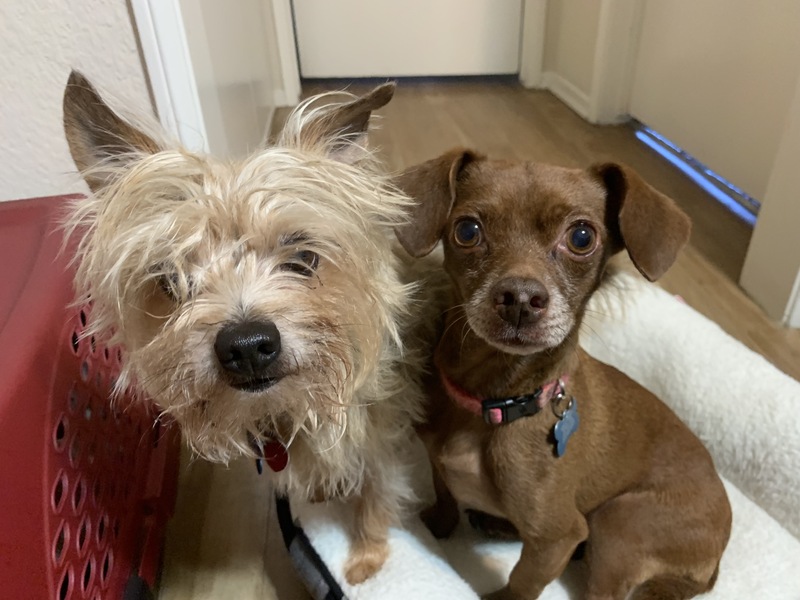 We introduced structured feeding to help 6 year-old Dachshund Frankie and 13 year-old Yorkie Chicken Little develop self control to stop excited urination and develop respect for their humans. I got to see some of the dog behavior problems the humans needed help with as soon as I sat down with the guardians. The dogs were excited and running around the apartment, jumping up on the guardians and the furniture. When Frankie jumped up on the couch after I gave him a bully stick, he did a little excited urination. Excited urination happens when a dog looses control and usually occurs when a dog is in an unbalanced state of mind. I made sure to let the guardians know that petting an excited dog can actually increase and amplify their excitement. This is actually the case for any kind of unbalanced state of mind (aggression, stress, fear, etc) and is probably the most common mistake a person can make with a dog. I recommended the guardians completely ignore the dogs when they are excited such as when the humans come home or before things the dogs really like. This is different than correcting the dog or giving it a command to do something else , essentially micromanaging. Stopping your engagement with a dog the instant it does something you don’t like is a wonderful way to tell the dog to stop it. Id like to see the humans come home ignore the dog until its calm before attempting to pet it, then stopping the petting the instant excitement returns. If they stick to this for the next few weeks, the dogs will learn that calm = attention and excitement (when the urination also happens) stops the attention. To stop the excited urination on the couch, I suggested a number of rules like not being allowed on the furniture, having to sit at doors, and to wait for permission to eat food which comes after the human eats and one at a time. You can learn how to add structure to meal time by watching the free positive dog training video below. Eating is one of the most important activities for dogs. By adding structure to meals, an activity that is repeated a few times a day, the guardians can build up the dog’s self control and respect for them as authority figures. Feeding a dog in a structured way can have many benefits that will help both dogs. Combined with petting with a purpose, passive training, increasing exercise and enforcing rules will all help the dogs learn to behave better. We covered a lot in this Los Angeles in home dog training session. And because Im a pretty chatty dog behavior expert, we recorded a roadmap to success video to help the guardians remember all the dog behavior suggestions I shared with them.